Lodi Rotary Parade starts by Bushnell Ford then comes down Main Street to Fair Street. Join us for our 38th Annual Susie the Duck Day Celebration. Lodi Rotary parade starts at 10:30am with parade marshal Lyle Hendrickson. The festival at Habermann Park (180 Fair Street) will begin immediately after the parade. Get a bite to eat from one of our many vendors and listen to the great Sunshine Band. You can also join us in our Kids Zone with Bounce Houses, dunk tank, puppet show, and more! Treinen Farm Horse rides and Smokey Hollow Tram and Shopping Cart Rides will be there as well. Wristbands will go on sale in July at any of our banks of the Chamber of Commerce office. $12 ahead of event, $15 day of. 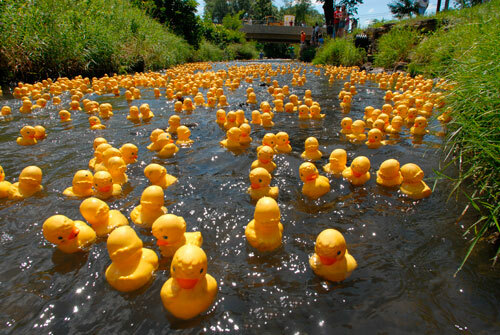 Enjoy the Duck Derby and see if your duck will cross the finish line first! Duck Tickets can be purchased at any bank in Lodi, Main Street Market Piggly Wiggly and other various locations before the day of event. Day of tickets can be purchased by Fire Station (9am-Noon), various locations through the parade route, and at Habermann Park (9am-2pm); Duck Drop will be at 2:30pm.